So last time I talked about figuring out the next step in the scroll making progress and dealing with procrastination. And I find myself at one of those procrastination type moments. 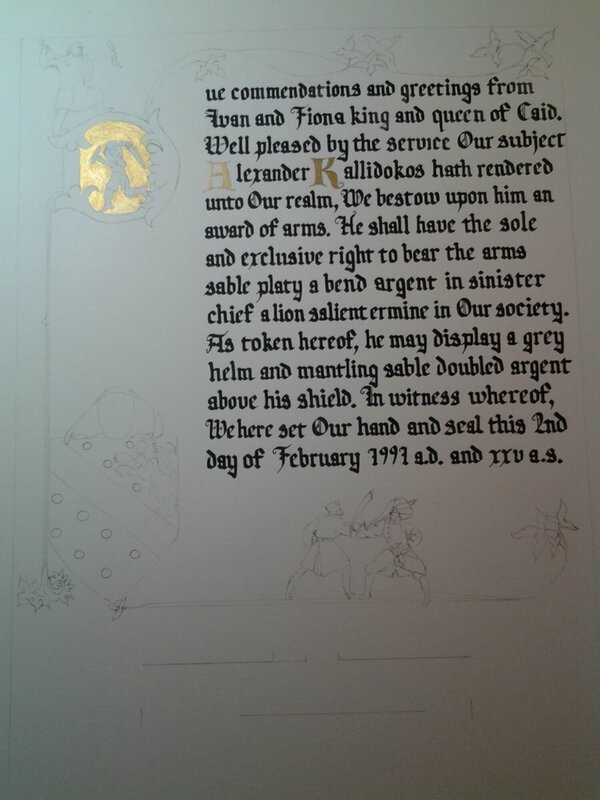 I have outlined the scroll in walnut ink and gilded the one capital letter in the scroll and also re-gilded the baronial coronet that sits on the top of the design. So, I should be ready to start painting (and I want to start painting) but I still have to design a little scene that sits at the top of the design. I know what I want it to look like, but my drawing skills are not quite up to snuff. I’ve been looking for reference images, both actual photographs and medieval scenes, and I haven’t quite found what I want. Or maybe I’m just delaying because I don’t think the vision in my head will match the final outcome. I do want to make progress on the scroll this week, so tomorrow, I’m just going to have to bite the bullet and tackle the scene. In the meantime, I’ve set up my color palette for the scroll. Last year I was fortunate to take a class at the Known World Heraldic and Scribal Symposium from the amazing Antoinette de la Croix, a Mistress of the Laurel in the Kingdom of Aethelmearc. It was transformative! While I’ve planned out the colors for scrolls in advance before (mostly), the idea of making a chart and writing down what colors I used and how I mixed them, is totally brilliant and I will be doing much more of this in the future. I’ve always wondered about scribes who take on award scroll assignments and then never work on them but I read an interesting article recently that I find very enlightening. It was a discussion about procrastination and that procrastination doesn’t generally come out of laziness, but out of anxiety. That people don’t do things because they are afraid it won’t be as good as they want and also because they really don’t know how to tackle the project. I think people get very excited about doing scribal work often after they’ve taken a class in calligraphy or a class in illumination or seen a scroll display at Coronation. They look at the scrolls and say I want to do that, that looks like fun, so they take on an assignment. But then they sit down to work on the scroll and get overwhelmed. Some get anxious that their work won’t be good enough, or that they don’t know any calligraphy or they just don’t know where to start. I want to help. I know what it’s like to feel anxious about my work, I know that looking at entire scroll makes it feel impossible to do something like that. But it’s really a matter of breaking it down into much small steps. I want to help. Let me know what you are working on, and together we can break down the process into smaller steps and identify the next one. If you don’t know calligraphy and don’t want to do that part, I can find a calligrapher. If you don’t know how to do a layout, there are templates on line that you can use (half-way down this page http://caidwiki.org/index.php?title=College_of_Scribes) , or classes that will teach basic layout. If you need help with painting or color selection, I can help. On the other hand, if your life has changed and doing award scrolls is something you really don’t want to do right now, that’s okay too. You can come back to it when you’re ready. If you don’t see yourself working on your assignment in the next six months, consider returning the assignment. When you are ready, there will be more assignments in the queue. But if you want to work on award scrolls and you are stuck, I want to help. Let me know what you want to be working on and how to contact you and let’s figure out the next step. You can leave a message for me here or on the Caid College of Scribes Facebook group. Let’s tackle the next step! Remember what I said last time about trying to keep this blog up more regularly? Still haven’t managed that. So I decided to make some new ones. I was stuck on what exactly I wanted to have them look like, until a scribe friend from back East shared a scroll that she had done in a Norse style based on carvings from a Stave church. Bingo! There was my inspiration. So here’s some pictures of the Norse-inspired award certificates. I have also managed (somehow) to make some progress on the Court Barony Scroll. Calligraphy is done. And I transferred the design to the paper I’m using. The transfer was a little faint, so I decided to outline everything in walnut ink which is giving me a chance to refine and fine-tune the design. I’m about halfway done. Scribe stuff and other things! So, the last year, I’ve been studying Hebrew and this past Friday night I did an adult Bat Mitzvah with my mom and 4 members of the Hebrew class. It’s a pretty amazing experience and the study of Hebrew and the prayers and my Torah portion took a fair percentage of my free time. Now, though it’s time to clear the decks and get my scroll backlog cleaned up. I’m working on this scroll, it’s really not the top priority scroll on my list, but it’s the one that calls to me the most right now to get it done. Here’s the rough layout. I need to do a little more clean-up on it. The vines will be white with grey shading. The background will be an ochre color. The flowers will all be natural (more or less). It’s best to do the calligraphy and proofread the text before you do the painting on a scroll, but just in case, proofread it again. Make sure the name of the recipient and the Crown are correct. Also make sure you have the correct award and award date. If you find a mistake, some can be easily fixed. Other mistakes may be harder, but there is almost always a way to make a correction. If you can’t figure one out, consult other scribes for suggestions. It’s easy to miss painting a corner or a small bug or single flower. Look over the scroll to make sure that everything is painted. Also, check to make sure that everything that needs embellishment is done. In a complex piece it’s very easy to miss a detail. Is everything outlined that needs it? Not all styles of illumination require that all things be outlined, but a number of them do. Go back and look at your inspiration piece and see where and what kind of outlines are needed. Many things are outlined in black using a crow quill or a brush. Some things are outlined in the same shade as the motif (or sometimes a darker tone of the main color of the motif). It’s generally a lot easier for monarchs to sign scrolls when they know exactly where to sign, so at minimum leave pencil lines for them to sign on. I think a scroll looks more finished when the signature lines are inked in rather than penciled (unless you plan to erase the pencil line afterward). It’s also a nice touch to label the signature lines (usually underneath) with Rex/Regina, King/Queen or something similar. Please make sure to leave enough space for the seals. It’s ok to have a seal cover part of the design, but the seals generally stick better if the area is not completely painted over. Please mark the center of where you want the seal to go. An X is fine, as is leaving a crown for the Kingdom seal and crossed trumpets for the Herald’s seal, or the initials KS and HS, or something. Please don’t leave the entire penciled circle for the seals, as the seals often don’t spread enough to cover all the pencil line. At the minimum sign your name on the scroll in pencil, on the back near the top of the scroll. You can also add your email address, and any information about the scroll you want the recipient to have such as materials especially if you used any toxic pigments, such as white lead, manuscripts that served as inspiration, etc. You may also want to add a signature or makers mark to the front, but make sure those are small and discreet. Take a picture of your scroll for your records. While you are at it, gather your layout, calligraphy practice sheets, exemplar images, and other bits and bobs and make a folder. If you do a similar style, it will come in handy. Take a good look at your scroll and pick out things that went well, and things that you would do different next time. Add those notes to your folder. I’ve never been a big fan of wearing a glove while doing calligraphy or painting on a scroll, but I’m also not a fan of getting hand oils on my scroll paper either. Depending on the type of paper you are using hand oils can cause the ink or paint you are using to bead up on the surface of the paper. It seems to be more of a problem with pergamenata and real vellum and less so with bristol board and hot press water color paper. If you aren’t using a glove, remember to wash your hands often while working on a scroll from layout to finishing (but make sure your hands are really truly completely dry before working on your scroll.) You can also put a scrap piece of paper under your hand to keep the paper clean. If you do get hand oils on pergamenta or vellum, you can use pounce as a fix. Pounce can be one of a number of things (or combinations of things), but it’s some kind of powder that will absorb the hand oils. Some things used for pounce are calcium carbonate, which you can get from cuttlefish bone, pumice powder and gum sandarac. You can buy pounce commercially or buy the ingredients and make your own by putting it in a linen bag. The pounce is dusted on to the paper and then lightly wiped in to the paper. Then brush the remainer off into a trash can. On pergamenta paper you can also go over the entire surface with a white eraser, and that will also pick up some hand oils. Or you can try wearing a glove. I generally only wear one on my painting/calligraphy hand and try to keep my off hand off the paper or only on the edges. You can buy gloves in a variety of places, Amazon has them as well as many drugs stores, but they aren’t cheap. Or you can look for stretchy gloves in dollar shows and use them. The third glove above is actually a toe sock I found in a dollar store. I tend to cut all the fingers off and use them that way, some people prefer to cut only certain fingers off the gloves. Experiment to find out what suits you best. So it seems I was right in the middle of working on this and getting in to the crunch time of trying to finish the scroll in time for presentation at 12th Night and so caught up in finishing that I didn’t keep up with the blog. The first step after calligraphy on most scrolls is the gilding. Now, this isn’t gilded, I didn’t use real gold, but it was easy to do the gold next in the order of things.